We’ve reached the final eight, and there are nothing but standouts in the bunch. That makes it a thankless job trying to pick between the cream of the crop and the creamiest. Yet even at this level, there’s Wartburg, John Carroll, Hobart and Widener trying to reach that semifinal level, hoping to earn a game next week with a chance to break through to UW-Whitewater and Mount Union’s level. Linfield and Wesley are frequently alive this deep into the postseason, so there should be no surprises in these picks and minimal hurt feelings. Pat, Ryan and I each make our predictions — this week, with explanation — without knowledge of what the others are writing, and then share it with you to set the national expectation. Anything that goes against the picks you see below is probably history in the making, something that will be talked about on campus and beyond for years to come. Clear off some space on your smartphone, as you’ll want to take some video to remember this day. It’s put up or shut up time. No player on any of these teams will graduate wondering what could have been if they’d only had a chance. This is the chance. Most of the other 236 Division III teams look on this Saturday in envy of the opportunity. The joy of the playoffs is history is written on the field this weekend. Will somebody break the mold, move up to a new level, write a new chapter in school history? We can’t wait to find out. Keith’s take: It’s hard to imagine these two dominant defenses (Mount Union allows 204 yards/game, John Carroll 238) getting gashed, but it’s hard to imagine QBs Kevin Burke and Mark Myers being held down either. In the teams’ past two meetings, JCU fell behind big, rallied and threw a scare into the Purple Raiders. In Week 11, JCU did a lot of its damage when it buckled up and ran right at Mount Union. If it can duplicate those results without first falling behind three scores, this could be a game for the ages. Mount Union’s offense features a QB whose line barely lets him get touched, and is a threat to run even if you do get near him. They are also three RBs and five WRs deep. Nobody has that many DBs who can win in man coverage, so look for a soft umbrella and room for Mount Union to run and hit quick throws over the middle. I wouldn’t be stunned if JCU won, but the Purple Raiders haven’t missed a semifinal round since 1994, so predicting a Blue Streak win would be predicting shockwaves rippling through the D-III landscape. Mount Union 31, John Carroll 28. Ryan’s take: We again get to see two of the best quarterbacks in D-III square off against each other. Both UMU’s Kevin Burke and JCU’s Mark Myers have more than 3,000 yards passing this season and have thrown for the same number of touchdowns, 38. Burke, however, holds a significant edge because of how dangerous he can be when he scrambles with the ball. While the last meeting between these two teams was very close and nearly got pushed into overtime, Mount Union’s ability to dominate has really shone through in the postseason. Shutting out Pete Coughlin and his Washington and Jefferson teammates is as convincing of a game as a team can have. John Carroll, on the other hand, failed to put up very many points against Wheaton and was a field goal away from getting knocked out of the tournament. Mount Union is doing what it always does in the playoffs, and we’ll see more of that on Saturday. Mount Union 28, John Carroll 17. Pat’s take: Generally the Purple Raiders do better when playing an opponent for a second time in the same season. And if Mount Union needed some help figuring out how to slow John Carroll, they certainly got a blueprint from Wheaton last week. Mount Union has more weapons on offense than Wheaton does and John Carroll won’t shut down Kevin Burke’s running game as readily as it did to Johnny Peltz last weekend. Mount Union 42, John Carroll 20. Keith’s take: Even the guys who complain every week about the Statesmen, who have been ranked no lower than 12th since the preseason, getting “no respect” have to admit the jig is probably up here. This deep into the playoffs, everyone has talented skill-position players and games are won and lost on the lines. Hobart needs Tyre Coleman and Marcus Jamison to get pressure on D-III’s second-most efficient passer, Joe Callahan. The Statesmen also need Ali Marpet and his fellow O-linemen to pave the way for the Statesmen’s running game while keeping Peyton Rose and Aamir Petrose off Patrick Conlan. Even if Hobart matches the Wolverines up front, Wesley’s team speed is such that it would take a turnover- and penalty-filled outing for the visitors to pull the upset (or come as close as they did in 2011). Wesley 42, Hobart 24. Ryan’s take: I haven’t picked Hobart to win yet in the postseason, and while the team has shown grit in getting through the first two weeks, it seems unlikely that they can get past the massive offensive and defensive performances that the Wolverines dish out. The national statistics spell out that Wesley dominance: fourth in total defense, 14th in total offense and first in turnover margin. I don’t know yet what my picks will be next week, but this is a Wesley team that has a legitimate shot at earning a seat in Salem. But not to get ahead of myself, this week is first and foremost on the agenda, and I wouldn’t be surprised if Wesley gives the Statesmen defense far more than it can handle. Wesley 38, Hobart 14. Pat’s take: The Wolverines will face their toughest playoff test and toughest D-III test of the season, perhaps. But Wesley has handled all of its D-III opponents with the ease of … whatever a wolverine does. Wesley might not score on its first six possessions of the game this weekend, but Hobart’s late heroics will come too late and too little as well. I would like to see Tyre Coleman take on that Wolverines offensive line with his eyes on getting to Joe Callahan. Wesley 41, Hobart 20. Keith’s take: Nobody look up the history of Triple Take picks in this round. I’m such a sucker for believing that the upstart can crash through to old-guard blockade. And every year I’m wrong, to the point where I’ve learned my lesson. All that said, we’ve probably undersold nationally what a threat Wartburg is. They’ve beaten Bethel, St. Thomas and St. John’s and have a win over a WIAC team as well, so they’ve earned their No. 5 ranking. Whitewater has won four of the past five national championships and loses their coach to University of Buffalo at the end of this run. That can go either way — The Warhawks can play loose, knowing any loss will be blamed on the coaching staff’s early-week distraction. Or they can play uncharacteristically, trying to send their coaching staff out on a high note. It was my experience, though, that external factors vanish after a series or two. The high from the pregame speech wears off. You can’t really hear anything anyone in the crowd is yelling. You’re not thinking about anything abstract. You’re locked in on what’s happening between those white lines, and if the Warhawks find Wartburg to be a team that can’t be pushed around up front, Matt Behrendt can loft a pass up to 6-foot-5 Jake Kumerow and take his chances. The Knights have a dangerous offense of their own with QB Logan Schrader, RB Brandon Domeyer and WR Taylor Jacobsmeier. CB Brady Grayvold and LB Justin Dischler will have to have big games. What sets UW-Whitewater apart is being excellent at simple stuff: They run the ball, play rugged defense and have converted turnovers into 254 points this season while allowing opponents only three points off turnovers. UW-Whitewater 28, Wartburg 20. Ryan’s take: With Jake Kumerow back, the Warhawks have too many offensive weapons for them to be slowed, let alone stopped, this weekend. The sort of Cinderella season that Wartburg has had will wrap up, but not before the Knights have a bucket-load of bragging rights over the MIAC. Wartburg put itself on the national map early this season, and it’s fitting that if that run had to end that it ends against none other but the defending national champions. Whitewater continues to play at another level, and that likely won’t stop until the team gets to Salem. UW-Whitewater 31, Wartburg 21. Pat’s take: Distraction? Sure. I mean, the head coach and basically everyone’s coordinator announced this week that they were leaving. But that won’t be enough to knock Whitewater out of the tournament – yet. I don’t think Matt Behrendt is going to be thinking about Lance Leipold’s Monday announcement (or his Wednesday one) when he’s being pressured by the Wartburg defensive front. Jake Kumerow will be out there for him regardless. Where I think this comes down to is special teams, and the question as to whether anyone in Division III can cover Kumerow. UW-Whitewater 34, Wartburg 30. Keith’s take: There’s a lot of unknown here, and that makes this matchup intriguing. With a tempo offense and an aggressive defense, the Pride are great fun to watch. Widener is at once the No. 1 run defense in the country and the only defense left in the playoffs outside the top 20. (They’re 40th, Wartburg is 17th and everyone else is in the top 12). On a dry day, that would probably mean Linfield tries and fails to establish the run, then lets Sam Riddle wing it all over Quick Stadium. With a 90 percent chance of rain in Chester on Saturday, I think both teams still try to run the ball to avoid having to throw so much, even though they do that well. After an early feeling-out process, it could go any which way. Ultimately, I believe the Wildcats are bigger, faster and stronger, and they’re playing with obvious inspiration that should wipe out any road weariness. (Linfield also made the cross-country trip on Thursday to negate the effect of kicking off at what would be 9 a.m. Saturday in Oregon). Fittingly, the Wildcats put up 35. 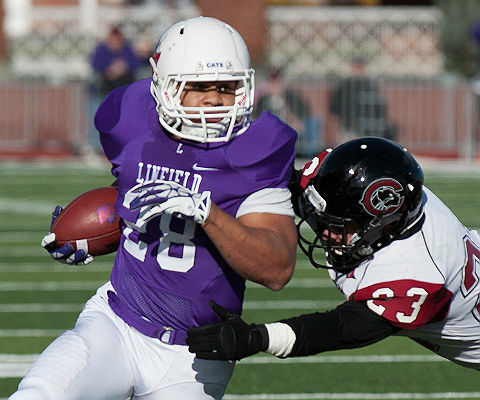 Linfield 35, Widener 27. Ryan’s take: The Wildcats played their toughest game of the bracket last weekend and emerged victorious. Linfield was able to make big plays against Mary Hardin-Baylor when needed and force four turnovers, including the game-sealing red-zone pick. By all accounts, though, the stats didn’t tell the full tale of how significantly Linfield dominated UMHB, and there’s little reason to think that the Wildcats won’t bring the same pressure to Pennsylvania against Widener. The Pride rallied to eke out a first-round win against Muhlenberg and played well enough against Christopher to move on, but neither of those teams compare to what Linfield has in store. This week should mark another road playoff win for the Wildcats. Linfield 41, Widener 21. Pat’s take: Back at the beginning of the playoffs we talked about Linfield possibly being able to ride the wave of emotion all the way to the semifinals. This is the week they do that. Widener has a couple of weapons that will provide a challenge but Anthony Davis can’t do everything. Linfield might not have an Anthony Davis but has more options on offense and while this could be a repeat of the Delaware Valley game, instead, Linfield has a better defense and will do a better job keeping Widener in check. Linfield 38, Widener 17. We invite you to add your predictions in the comments below, or tweet at us at @D3Keith, @NewsTipps and @d3football. Download the Around the Nation podcast on Mondays, where Pat and Keith review the picks and the most recent round of playoffs.